The woman who warns us about propaganda in zoos – hilarious or scary? Incredulous woman can’t understand how theories of science appear on printed signs! Go to the zoo with creationist Megan Fox and learn that zoos are failing in their duty towards humans. She loves the animals, why, she even got married in the zoo, but the notion of humans being apes is just hilarious. She reads ecologically informative signs in the various enclosures in an outraged tone – ‘Oh, humans are baaad!’ Megan thinks children should be entertained and informed about the eating habits of all the marvellous animals instead of learning critical information about destruction of habitat and loss of species. Megan says not all humans are bad. Hunters, for example, give all sorts of money to protect animals. Hunters conserve. Like in Zambimbia. (SIC) Hunters feed hungry people. The EPA buys weapons and donuts. They don’t clean up streams. It’s all political nonsense. You really want more? 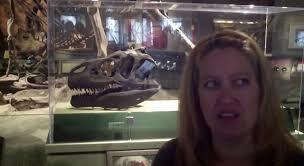 Here is her incredulous visit to the American National History Museum with commentary from someone who actually thinks. Thank you, AnswersInEddas. It’s a fairy tale. She’s just making it all up!! My only comfort is when her children become teenagers they will revolt and start learning just to spite her. Oh, I cannot wait. Megan Fox doesn’t want a relationship with nature. She is unnatural. This entry was posted in Animals, Climate Change, Future and tagged AnswersInEddas, Low Hanging Fruit, Megan Fox, outraged blogger. Bookmark the permalink.